After a lazy day in bed, I admit it's almost 3pm and I'm still in my PJs but the fact that within 24 hours I spent 20 of them at work I'm allowed to be a slob for a day - I guess by now there's no point getting dressed. Anyway I thought I'd have a quick blog hop and was wowed by the very first one I happened to 'hop' onto. Shelley has made this gorgeous card, and from the looks of the watercolouring you'd have no idea this was her only her third attempt. 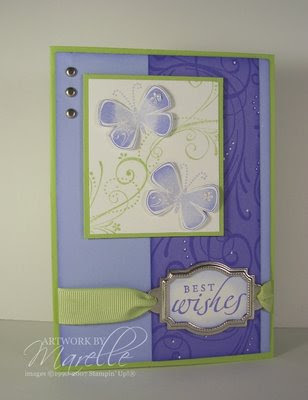 To see more on Shelley's wonderful creations you can visit Shelley's blog Stampin-Shellz. Hi Guys, Lisa G here. 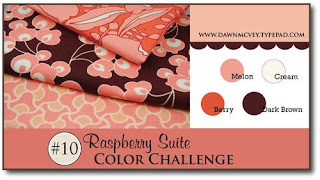 I have really been getting into Dawn McVey's blog lately, she has such classy taste and a superb eye for design and colour, So in line with the "challenge" theme, I thought I would post her very popular colour challenge. I have been getting so tired of not being creative, I LOVE making cards and scrapbooking, papercrafts in general and I LOVE Stampin' Up! so very much. 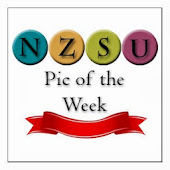 2) to participate in at least 1 challenge that the NZSUblog has put up on the website, and I figured if I publicise this with you, the fellow blogger, I might actually DO some crafting! Check out this blog for more sketch challenges. There's a new one every Sunday. Love this weeks sketch - I know Michelles already had a go at it and made a stunning card. Here's another challenge for you to check out. This one is by Marelle Taylor - a very talented Aussie Demo. 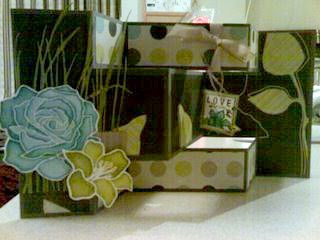 I really like the idea she's come up with - and I liked her card so much I've added it to my folder of cards to case. To see what her challenge is all about - check out Marelle's Blog for details. How about a colour challenge? 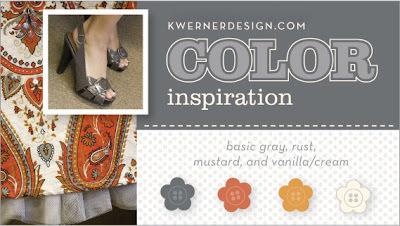 K Werner regularly has colour challenges and the entries are stunning! I'm pretty sure this is the latest. 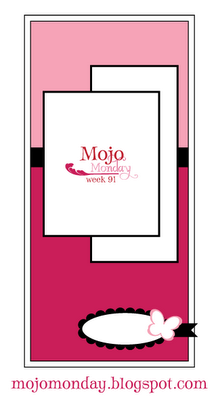 This is a great blog for sketch challenges and if you've lost your Mojo. Every Monday (Tuesday for us Kiwis) a new sketch is posted. Here's the link to see what everyone else has been creating and to see older sketches. If you participate in the challenge and want to share your creation you can leave a link below. It's been ages since we had an Inspiration post - actually I havn't been doing much around here, life just seems to be getting in the way. talented stamper, she's been featured here a few times. If you havn't already you must check out her blog Me & Mi Stamps. I promise you will not be disappointed!